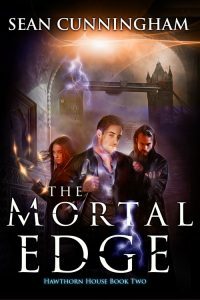 What you don’t get a lot in fantasy or urban fantasy, at least in my experience, is a story in which the main character is a healer. Superhuman demon hunter who can shove her fist through a monster’s ribcage? Yes. Snarky warlock who can incinerate all enemies with green fire? Yes, that too. Defenders, protectors – yes. But not often someone who’s priority is to heal. I played massively multiplayer online games for several years and in the time that I did so, I gravitated towards the healer roles. Some players like to stand toe-to-toe with the giant bellowing ogre and smash it with their swords. Others prefer to stand back and blast away with an assortment of magic and missiles. Me, I liked to keep them all alive while they did so. 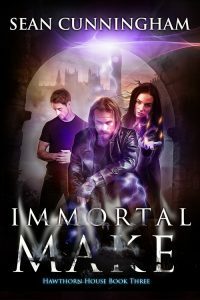 So I was interested when I came across the first novel in M. Terry Green’s Techno-Shaman series. Livvy Lawson is a shaman living and working in LA. 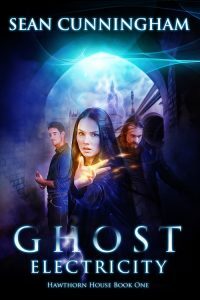 She scrapes by while travelling into the spirit world to rescue those who are spiritually ill, or who have had a spell of ill intent cast upon them by another shaman. And then someone unleashes an ancient monster from the dawn of time. Livvie, who just wants to help people, has to do something about it. I didn’t quite connect with it and I had trouble articulating why until I read the author’s notes at the end. The author has made a point of keeping the book young reader-friendly. YA doesn’t really appeal to me and I think this is the main reason I didn’t connect with it more. I think it’s a well-written book and if the above sounds good to you, you should give it a try. It deserves the good ratings it gets. 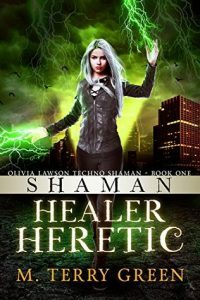 If you’re looking for an urban fantasy read that veers away from the usual vampires/werewolves etc, take a look at Shaman, Healer, Heretic.